EXCLUSIVE AND UNPARALLELED COLLECTION OF THE WORLD'S BEST NOVELS, SHORT STORIES AND POEMS!!! This incredible Harvard Classics Library Complete Shelf of Fiction collection represents a lifetime of reading, carefully selected by the world's leading experts on literature and philosophy at Harvard University. 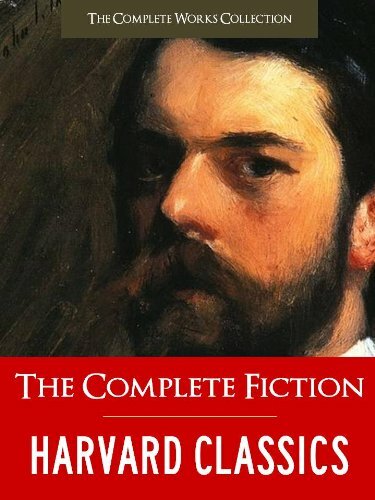 The publication of the Harvard Classics Library Complete Shelf of Fiction in the Kindle(tm) format represents a milestone literary event. For the first time ALL of these works are available in a single volume. ESPECIALLY FORMATTED FOR KINDLE WITH INTERACTIVE TABLE OF CONTENTS AND FULL COLOR ILLUSTRATIONS AND INTRODUCTORY ESSAY BY HARVARD UNIVERSITY LITERATURE AND PHILOSOPHY SCHOLARS! These are 200 works that everyone should read before they die. It includes such well known classics as Pride & Prejudice by Jane Austen, David Copperfield by Charles Dickens, the Complete Sonnets by William Shakespeare, The Hunchback of Notre Dame by Victor Hugo, Tom Jones by Henry Fielding, Old Goriot by Honore de Balzac, Anna Karenina by Leo Tolstoy Crime and Punishment by Fyodor Dostoyevsky and Fathers and Sons by Ivan Turgenev, as well as relatively unfamiliar works. As former Harvard University president Charles Eliot writes, "There is no work in the series which does not illustrate good literary form, and none which may not be read over and over again with pleasure and profit. It provides the intellectually ambitious family with a body of interesting and enjoyable literature, good not only for the present generation but for their children and grandchildren." and hundreds of pages of more works of outstanding literature! WHY BUY BOOKS FROM THE COMPLETE WORKS COLLECTION FOR KINDLE EDITION? 1. All COMPLETE WORKS COLLECTION books are priced as low as possible in order to offer unbelievable value and hours of reading pleasure for Nook readers. All COMPLETE WORKS COLLECTION books bring together ALL the complete works of a classic literary author, character or series in a single, extremely low priced volume in a single download, thereby freeing up valuable space and visual clutter on your Kindle device. 2. All COMPLETE WORKS COLLECTION books are painstakingly formatted especially for Kindle and come with a FULLY INTERACTIVE table of contents, Audiobook (Text to Speech) and Free Lending Technology. 3. All COMPLETE WORKS COLLECTION books come with additional material including illustrations, and critical, biographical and/or historical commentary.